Hey, I was born in Taiwan where I lived my baby age until five with a bunch of animals including dogs, I have always had alot of animals in my life. We moved around in 5 year cycles Taiwan - Finland - Beijing - and back to Finland for good. Not long after I was my first episode of Belle & Sebastian, I just knew I had to have one of those magnificent white guardians to call my own. I used to watch Belle & Sebastian as a cartoon when i was small, and dreamed of my future. Having something as beautiful and loyal to protect and befriend me. 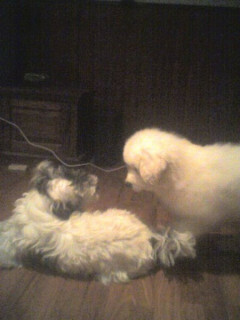 To have that for my children... i would never have guessed that my dreams and expectations of a pyr could be fullfilled. 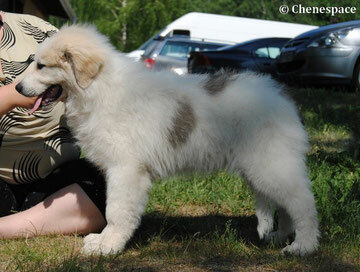 But our first pyrenean, Luna, did it all and then some! When I was ten, we moved to Beijing where I got my 1st very own dog, Urho. At best I had 8 rabbits and 1000 or so fish in many aquariums, tortoises and turtles and a leasing horse. You name it, I had it. I've always had an animal rich life, and Beijing was no different. Once we moved back to Finland with our 3 dogs I my teen years flew past with my dogs at the stables with my Finnish horse. My teens were spent at the stables working and riding seven days a week….. I actually had a chance to get a really nutty ex-trotter, to call as my own. I started working with Turbo to train as a riding horse for myself. He lived to the ripe age of 22 from which the last two years he spent on a meadow with a few other elderly horses. 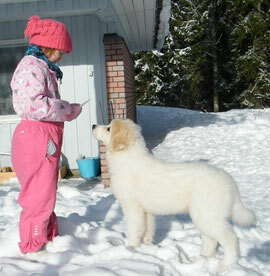 Very easily put, he was very much like my first pyr by nature and he was the dearest thing to me for many years. Before Turbo was put down I met my current hubby at the age of 19. We didn’t take long to move in together and dream of the wonderful future. The rest as they say, is history. We moved to our first own home, in Porvoo in 2006 with our 3 dogs. Urkki was put down because of a paralysis of the front with a very poor prognosis of survival in 2007. Life felt empty for a while without my teenage companion. After all for a long time, she was the one friend who always followed me, in all my moves and life stages. We moved 2012 to Janakkala, to our current life in "Vikkilä". I had looked at pyrs many a year already, but then I finally felt like it was time for my dream breed. The pup I fell in love with thru photos was everything I hoped for. Luna was her obvious choice for a name as she was white as the moon itself. I got the opportunity to name her myself, and She became Ataciara Alapa, inuit for a familiar spirit in the cold. Added with Danza ConLobos, she was the familiar spirit in the cold dances with wolves. She was the light of my life since the moment she arrived. Such a sweetie!! Luna really filled my hopes and dreams of a pyr. That big white majestic animal who loved her family, and protected it the best she could. She brought me to the wonderful world of pyrs, and i have never looked back. She was the invader of my couch and the guardian of my house. Most importantly, she held my heart and always will. It is difficult to say without sounding cliché, but to me she was Foo Gou (chinese golden lion), my very own good luck guardian. The guardian of our happiness, much like in the tales of anchient China. She was sadly taken before her time and we lost her 2011 christmas night. 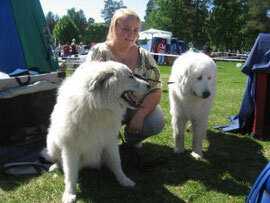 I am very active at showing my dogs, not only in Finland but i love to travel with my dogs to international shows all over. I noticed I was dreaming of dog shows and researching bloodlines and genetics and hip scores very soon after Luna arrived. Then I found myself researching upcoming litters, and realized that the pyrs invaded our hearts once and for all. I want to find co-operative homes and breeders in the future to help eachother better this lovely breed even to a healthier direction. Also the International co-operation between breeders is vital for our breeds preservation. We want to have time to concentrate on each of our dogs individually which is why some of my kennel dogs are co-owned, placed with breeding terms, or invested to a home with agreement for a litter to me. I hope to find working homes for at least some of my puppies, and the puppies will be tested to find the most suitable one for each buyer. Until now we are proud to say that even with rigorous questioning for puppy owners we have managed to find such fabulous homes for all our breeding that only one has, thus far, been rehomed. Even Helmi was re-homed not because of managing her but she has storagemite & wheat allergy which was proved too much to manage with small children & crumbs & itching. Health to me is very important so i hope to have as many of my litter puppies health checked for eyes, hips, patella, elbows and shoulders. All of my breeding use dogs have been checked for these, and I encourage my puppy buyers to do the same to get as clear and insight to my litters health, and our breeds health in Scandinavia and all over Europe. For a quick view into the life of a Mountain's Pearl, click here!